RELOCATING a Sydney team to Queensland won’t work, Ipswich-based Western Corridor NRL bid chairman Steve Johnson says. While Johnson didn’t want to see a Sydney club die, he doubted whether Queensland fans would embrace a NSW team. The expansion debate has again reignited with the NRL at the end of the year to deliver a report into the viability of adding a 17th and 18th NRL franchise with south-east Queensland and Perth in the mix. And relocation is on the agenda with NRL chief executive Todd Greenberg saying Rugby League Central was seeking greater power to move troubled clubs away from the crowded Sydney market. While Western Australia’s rugby league boss John Sackson claimed Perth would embrace any team relocated to the city, Johnson reckoned Queensland fans wouldn’t cop it. “We have been firm in the view that we don’t want a relocated team,” Johnson told AAP. “Preferably we would like to start a club with our own values and our own history. “The Western Corridor is a rugby league heartland. “If you relocate another team will the fans buy into it? I think it is doubtful. Manly, Cronulla and the Wests Tigers are seen as clubs most likely to be moved. But Johnson said a second team in Brisbane competing with the Broncos would only work if it was Queensland-based. 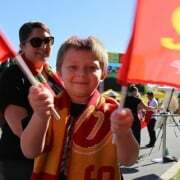 “We have no doubt if we start our own team the fans will travel to Suncorp every week to support their team and also travel more regularly to watch the Broncos,” he said. “If we start our own club it would not only be wonderful thing for not just our own area but also for the Broncos to add to their patronage. 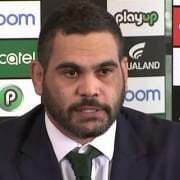 “But if the NRL relocates a team, whose team is it? 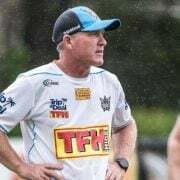 Johnson also dismissed talk the Ipswich area – which has produced the likes of Allan Langer and the Walters brothers – lacked the player depth for a new NRL team. “That has been a comment thrown up by people in Sydney jealous of protecting their own patch – depth has never been a problem,” he said. Johnson said an Ipswich NRL bid had been ready to go since 2011. “I will be excited when Todd rings and says it is going to happen because we have been down this path before,” he said.